NOTE: The descriptions are to let you know what you can get from the session. However, every 1 on 1 or drop in session is geared to what you need and want. January 2019 brings a new outlook for us. There will be no scheduled classes; if there is anything you are interested in learning call Carmela for an appointment. ​and 1 on 1 sessions are available. We ask that you commit to attending all of the sessions for which you are scheduled. ​Our instructors are volunteers who commit to being there for you. 1 on 1 sessions are about an hour and are scheduled by you to meet your needs. Just call Carmela to make arrangements. 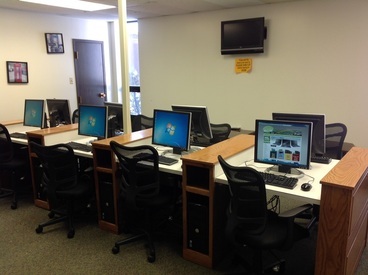 Drop In Sessions are about an hour and are available to anyone who wants to drop in to the Computer Lab on any day on which there are no classes. We have someone there to help you. Come visit us at the H.B. Kuhn Senior Center!! Our Computer Training Classes continues to grow. In preparing for the computer age, we are continually working to provide classes for everyone interested in understanding and using computers (devices). If you have a yearning to be a part this project, we would be happy to have you join us. Complete and submit the form below. A bit of history!! - We started with a survey that showed us there is an interest. We now have more than 90+ people signed up. Our first classes were designed for the beginners, introducing them to basic computing. Now we are continuing to grow from there. Check out our graduates! Let us know what you are interested in so we can provide what you want. Remember this is your Club. If you are a 55+ Village resident or a member of one of the seven Town of Colonie Senior Clubs and would like to be a part of our growing computer class either as a student or an instructor please complete and submit the form on right.